The revised enforcement decree of the Minimum Wage Act takes effect starting Tuesday, following its approval by the Cabinet on Monday. Amid a strong backlash from the business sector, the government decided to include hours of paid rest in working hours when calculating the minimum wage. The enforcement decree was revised in a bid to eliminate the confusion surrounding the definition of working hours, the Labor Ministry said. The government had planned to pass the decree Dec. 24, but its passage was delayed due to disagreements among the related ministries. Under the labor law, an employer must give eight hours of paid rest if an employee works more than 15 hours a week. Some large companies give an extra eight hours of paid rest in accordance with contracts with labor unions. The minimum wage in Korea is calculated by dividing the monthly salary by the number of working hours. According to the Labor Ministry, hours of paid rest were originally included in the working hours when calculating the minimum wage when the paid rest system was implemented in 1988. But a 2007 Supreme Court ruling created chaos by refusing to recognize those hours as working hours. The newly revised decree aims to reduce the confusion by stipulating that hours of paid rest count as working hours. To reflect the employers’ concerns, the extra eight hours of paid rest given by large companies to their workers are excluded from the revised minimum wage calculations. 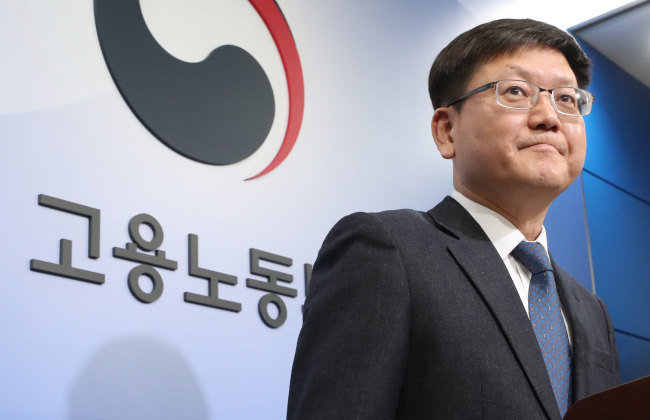 The business sector, which has opposed the Labor Ministry’s argument based on the Supreme Court’s ruling, claims that the increased working hours can raise the chances of violating the Minimum Wage Act. The sharp minimum wage increases for 2019, up 10.9 percent from this year’s, fueled the employers’ anger as well. Meanwhile, the government decided to include the regularly paid bonuses surpassing 25 percent of the minimum wage and welfare benefits exceeding 7 percent of it in the calculation of basic wages from Tuesday, as part of efforts to ease the financial burden of employers. According to the Labor Ministry, the minimum wage consisting of only basic pay and fixed allowances had caused employers to violate the Minimum Wage Act even if they paid high salaries consisting of low basic wages and large bonuses. The government said it would give a six-month grace period to companies to change the wage structure.